Full of cheer, joy, laughter and love until, literally, the last moment of her life, Hilda (Shanta-Ma) Densmore passed away on December 26th at Sarah House. Her memorial will be at the Vedanta Temple, Sunday January 17th, 4pm followed by reception in the convent. 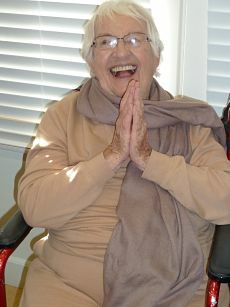 She s survived by her son, Robert Densmore and Andree Laval; her daughter, Pravrajika Vrajaprana, a nun at Santa Barbara’s Vedanta Temple; grand-daughter Nicola Densmore and Darrin Enerson; Lesley Densmore Anderson and Jordan Anderson; Grace and Rick Gomez and great-grand-daughters Julianna and Alison Gomez. She is also survived by the many people for whom she was a substitute mom and loyal, loving friend (plus fiendish card shark). The original “hugging mother,” Hilda was eager to love, embrace and hold in her arms all those who came into her considerable orbit. She specifically instructed that no one grieve at her departure, but rather “share the love,” as she so often said, and respond to life’s difficultues with strength, gratitude and inveterate cheerfulness. In lieu of flowers, please donate to either Sarah House, where she joyfully lived during her final nine months, or to the Vedanta Temple, which was her spiritual home.